He left peacefully, he did not have time to suffer. He is now galopping in wonderful meadows with the other Mearas, taking care of his brother and sister who had left before him to the RB, Elliot and Penelope. Please, read below what was his life like since the wonderful day he became a part of our family. We will always love him. When I was in Fontainebleau, Anne was leaving the flat from time to time and she was coming back after a couple of hours with a weird smell on her clothes.....the smell of an unknown animal..
One day, she took me with her to introduce me to that special animal!! what a shock to me!!! Quisoris was born on May, 19th 1982. As a huge celtic dog, my morphology is really beautiful but unfortunately, beauty does not always rime with rapidity..so she was going away with Quisoris without me!! My wonderfully shaped legs could not follow his!! Have you noticed the length of his legs?? Anyway, I'm always glad to go to see him!!! He si very fond of orange tasteless stuffs..
His field is so close from the ocean!!! The soil near the ocean is good fur his coat, just have a look at him! Well..he has a very peaceful life...he deserves it!! 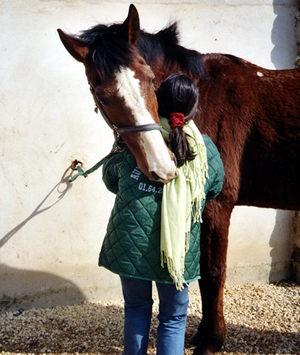 Please consider signing the petition below for french horses! !